/ Modified jul 16, 2012 4:50 p.m.
Astronomical technology at the University of Arizona's Steward Observatory Mirror Lab is being turned toward the sun in the form of a project that may help boost solar energy use. The lab has been working in the industries of astronomy and telescopes for decades. Now it is conducting studies to create prototypes that might eventually facilitate large-scale projects to draw sunlight for electricity using specially designed mirrors. "At the source it's free, but actually harvesting it and turning it into electricity at the moment, it's too expensive to be competitive with conventional generation," says Roger Angel, director of the UA mirror lab. 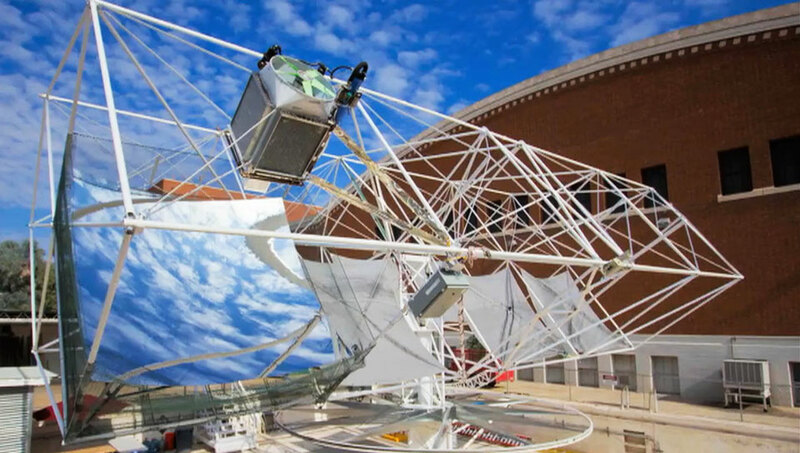 The lab recently received a $1.5 million grant to focus on mirror technology that could help solve one of the biggest challenges with solar energy: capturing and using the sun's resource in a feasible and efficient way so that subsidies are no longer required. "So if a utility wanted to switch to solar energy right now it would be paying two or three times or would have to charge two or three times as much," Angel says. "The bad news is two or three times too expensive and the good news is that it's only a factor of two or three at which point there would be a huge transition to solar energy." Bringing the price down is imperative, Angel says, adding that his lab's photovoltaic prototype is also ideal because it doesn't use water, which is especially important in Arizona and other dry regions.